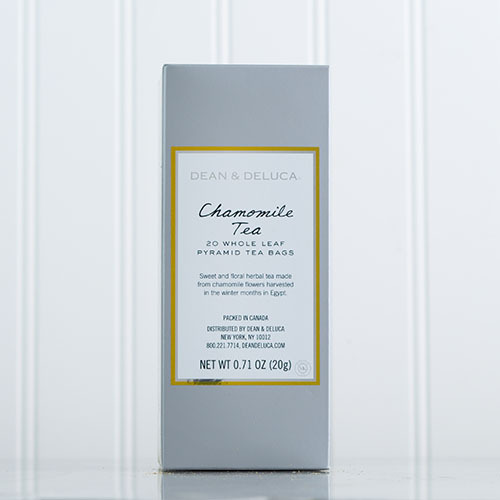 With a yellow-gold infusion and a characteristic flora fragrance, our DEAN & DELUCA Chamomile Tea possess a sweet fruity and honey taste. Use 1 cup of hot water per teabag. The word chamomile comes from the Greek chamaimelon meaning "earth-apple", which is derived from chamai meaning "on the ground" and melon meaning "apple". It is so called because of the apple-like scent of the plant. For centuries, chamomile has been used in traditional medicine as a calming herb and for soothing digestive problems. Bring to a boil fresh water, pour over 1 teabag per teabag. Let steep 5 minutes. Remove teabag.